WordPress does a lot of things well. But, at least out of the box, being able to create a conversion-hungry landing page is not one of those things. Let’s change that – in this post, I’ll teach you how to create a landing page on WordPress even if you don’t know how to write a single line of code. Better yet – I’m going to show you how to do it using a free plugin. That means, in addition to not requiring any code, you also won’t need to reach for your wallet to follow this guide. I have zero design ability. So if I can do it – so can you! 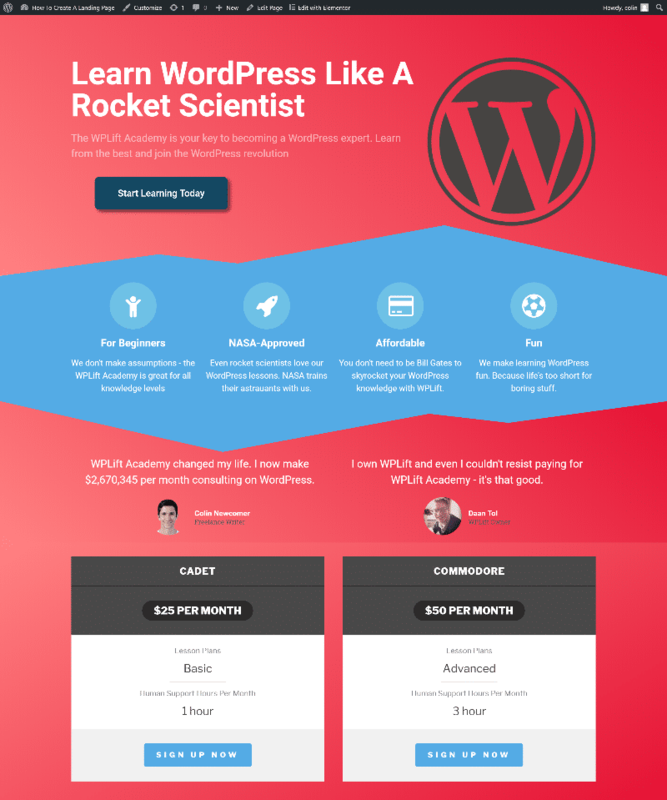 If you’re ready to learn how to build a WordPress landing page, let’s jump in! You have access to all the necessary elements to build a landing page. For this tutorial, I’ll exclusively use the free version of Elementor to keep to my promise. The free Elementor plugin – you can download it here. If you want to keep things entirely free, you’ll also need a third-party plugin for one section (more on that later!). Or, you can always purchase Elementor Pro for a simpler approach (there will also be more on this at the end). This tutorial will work for every single WordPress theme – so don’t worry about any issues on that end. Ready to get started? Let’s gooooo! Before I start digging into the tutorial, I want to give you a quick introduction to how the Elementor interface works at a basic level before I dump you into building a landing page. Elementor is a visual page builder, which means that you can desistepgn your pages in the same view that your end users will see it. Essentially, you’re looking at what they’re looking at. Sidebar – this is where you can add “elements” (the building blocks of your landing page) and style them with a ton of detail. Visual preview – this is where you can preview how your landing page will look. Each element sits inside a section. You can also configure sections in a similar manner, which is helpful for adding things like backgrounds and adjusting spacing. Why that random thought? Because before you can start creating your landing page, it helps to know what you actually want to build and at least a general idea of how it should look. If you’ve never built a landing page in your life, you might want to spend some time reading up on the basic principles of landing page design. Or, you can always just take inspiration from some of your favorite landing pages. You know what they say about great artists! In real life, you might want more elements – but for our fictional landing page, this should give us enough “meat” to make the tutorial worthwhile. All those things add clutter and get in the way of creating an effective landing page. And now you’re ready to jump into the Elementor interface and start building. And now you should see a full-width background section with a nice gradient effect. Now that you have the background section, it’s time to add some content. Next up, you’ll need to add some content to the right side of the hero section. To do that, drag over an Image element and upload a relevant image (I’ll choose the WordPress logo for this example – but don’t use it in real life!). But let’s kick things up a notch with one of Elementor’s cooler features – a shape divider. A shape divider is basically a way to divide (or connect) two different sections on your landing page. Next up, it’s time to list out the various features of the WPLift academy. Remember that shape divider you just created above? We’re going to connect it to the background section of our Features list. To display the features, I think the Icon Box element provides a neat solution. To get started, drag an icon box into each of the 4 columns in the section. Then, customize the text, colors, and icon as needed using the sidebar interface. Changed the font colors in the Style tab. Social proof is a great way to convince people to sign up – so let’s showcase some testimonials on our landing page! For the testimonials background section, let’s get a little fancy and use a shape divider to connect with the feature list above. Problem fixed! Now, let’s add some testimonials. The free version of Elementor includes a Testimonials element, which makes it super easy to add testimonials to your landing page. All you need to do is drag over a Testimonials element to each column. The name and job of the testimonial giver. Then, pop over to the Style tab and change the text colors and sizing as desired. Only one thing left to do to bring us home. Unfortunately, the free version of Elementor does not include a pricing table element (you can get this as part of Elementor Pro, though). Install a third-party Elementor add-on that includes a pricing table element. Before that happens, though, you need to create the background section for the pricing table. You could always recreate the section from scratch – but why not save a little time and not duplicate work? At this point, you need to open a new tab and head to your WordPress dashboard. There, install the free Addons for Elementor plugin. Then, go back to the Elementor interface, save your changes, and refresh the page to load the new elements. Then, all you need to do is configure the pricing table using the sidebar options. You can add as many pricing options as needed, but I’m going to stick with two for the WPLift Academy. Now, all you need to do is make it the homepage for your WordPress site. To do that, go to Settings → Reading. Now, when visitors go to your homepage, they should see the awesome landing page that you just created with Elementor. Everything that I showed you above can be done with the free version of Elementor (and a free Elementor add-on). Functionality – you get the ability to build forms using Elementor, as well as other helpful features. Templates – you might not even need to build a landing page because Elementor Pro includes 100+ pre-built templates. Elements – you get pricing tables, price lists, animated headlines, and lots more without the need for third-party add-ons. Elementor Pro starts at just $49, which is fairly affordable as far as WordPress page builders go. Because of all the little steps, I wasn’t able to take a screenshot for each tweak that I made on the WPLift Academy landing page. Despite that, I hope you were still able to follow along and learned something new about how to create a landing page on WordPress using Elementor. While there are plenty of other quality page builders (e.g. Divi WordPress builder) out there, I find Elementor to be the easiest, quickest way to build a landing page using WordPress. If you have any questions about Elementor, landing pages, or any of the steps I took in the tutorial above, be sure to leave a comment and I’ll do my best to try and help you out. Excellent elementor plugin usage tips, very detailed, we offers lanindg-page creator without code too and 1-click ready templates importer. Thanks for this detailed write up on WordPress custom landing page creation. I think this will help me to do few A/B testing which I have planned to start from coming week to track my conversion rates and few other metrics against my paid campaigns. Hello i have service provided on Printer, Computers, Microsoft Office and Business Page you have get the best solutions The MS Office 365 is designed as a way which gives the unique experience to the users. If you run any business then I suggest you to go with MS office 365 because it facilitates too many features for their users like: easily create, edit, organize etc. But in most of the cases users found technical hiccups regarding MS office 365 like: office 365 is not open properly, working very slow, virus infected problem etc. To fix these kinds of errors you have to contact Microsoft office 365 technical support & get the quick assistance Office.com/Setup.